The maximum sum path may or may not go through root. For example, in the following binary tree, the maximum sum is 27(3 + 6 + 9 + 0 – 1 + 10). Expected time complexity is O(n). A simple solution is to traverse the tree and do following for every traversed node X. 2) Find maximum sum from leaf to root in right subtree of X. 3) Add the above two calculated values and X->data and compare the sum with the maximum value obtained so far and update the maximum value. 4) Return the maximum value. 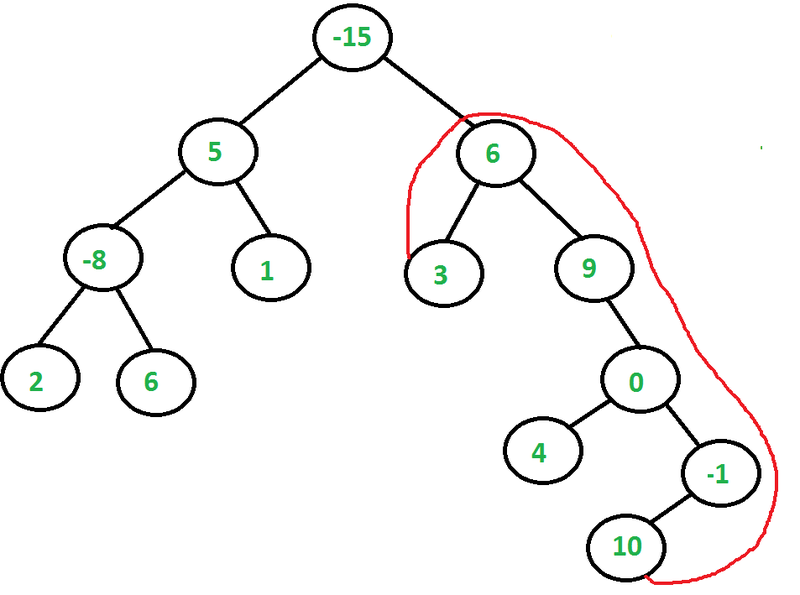 1) Maximum root to leaf path sum for the subtree rooted under current node. 2) The maximum path sum between leaves (desired output). For every visited node X, we find the maximum root to leaf sum in left and right subtrees of X. We add the two values with X->data, and compare the sum with maximum path sum found so far. Following is the implementation of the above O(n) solution. // 2) The maximum root to leaf path sum which is returned. cout << "Max pathSum of the given binary tree is "
// same value can be used by multiple recursive calls. System.out.println("Max pathSum of the given binary tree is "
Max pathSum of the given binary tree is 27. Thanks to Saurabh Vats for suggesting corrections in original approach.